Definition - What does Mountain Pose With Arms Bound mean? Mountain pose with arms bound is a simple variation of mountain pose (tadasana) that opens the chest and shoulders. Mountain pose, with its various hand and arm positions, is one of the key postures in the Sun Salutation vinyasa. Standing with the feet together or up to shoulder-length apart, the yogi pulls the shoulder blades together and reaches the hands across the back to hold the opposite elbows. The gaze is forward. 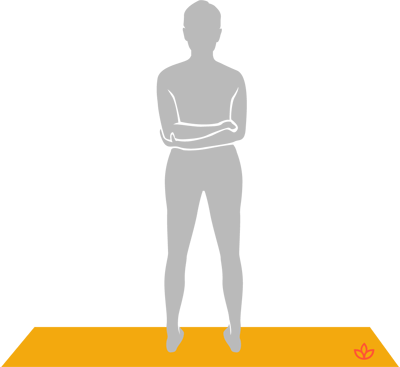 The pose is known in Sanskrit as tadasana paschima baddha namaskar or paschima baddha hastasana, depending on the style of yoga. It is also known in English as west bound hands pose or back bound hands pose. Yogis who suffer from migraines, insomnia, eye strain, shoulder injuries or low blood pressure should not practice mountain pose with arms bound.